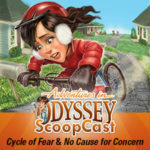 It has become somewhat of a recent tradition to see Adventures in Odyssey releases rolled out first to Odyssey Adventure Club members, then via digital download, and finally—for collectors—the CD version. With Album 60 now shipping from Focus on the Family and other outlets, I’m sure fans will be excited to grow their collections. The album is also available as a digital download and via the Odyssey Adventure Club. Fans can also be watching their local Christian bookstores in the days ahead. These episodes have not yet officially aired on radio stations and online streaming, so if you’re waiting to listen that way, be listening this Spring for the debut of Album 60. We’re living in the age of instant access to Adventures in Odyssey. If you grew up with AIO during the 80’s and 90’s, you know it was tradition to tune in on the radio each week for new episodes, and that was the only way to hear Adventures in Odyssey episodes first. Boy, have things changed! 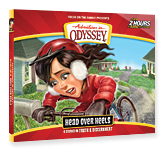 Visit our product page for more information on the latest Adventures in Odyssey release and access ordering links .